Handling a large pack of dogs is a balancing act. Making sure that every dog’s needs are met, while attempting to dispel any conflicts arising, due to the different personalities of each dog. Add in the fact that half of our dogs are very high energy Jack Russell Terrier mixes, and it’s like walking a tight rope some days. 1. Scheduling is your savior with a large pack of dogs. The first thing that I highly recommend for a household with a large pack of dogs is a good schedule, that works for both the humans and the dogs. My watch could be set by my dogs. We have wake up times, potty times, play times, meal times, nap times. Things go much smoother on the days that we can stay on schedule. Maybe I’m a little OCD about this, but it really helps when the dogs know what to expect next. On days when I have to leave the house and the schedule gets off track, things can be a little more difficult. But even if we can’t do the schedule on time, we stick to the same order of things. Unexpected guests are another occasional problem. Especially if they catch us at a bad time, such as when everyone is wound up for play time. It becomes a little harder to calm them down during these moments. Depending on which group I am working with at the time, crating them is usually necessary for the younger dogs. While the older ones can just settle on their own, or be sent to their rooms easily. Keeping to a basic schedule, or routine really helps control a large pack of dogs. 2. Basic training is a must for handling large packs of dogs. Having everyone in a large pack of dogs trained helps tremendously. At least with the basic commands; sit, stay, stop, down. Having them trained to “leave it, or drop it”, also, is even better. All dogs should be taught at least these basic commands, to be a good canine citizen, but in a pack, it’s needed even more so. 3. Maintain confidence to maintain control. They need to know that you’re in charge, just as much as you need to know that you can maintain control. Always being aware, or at least semi-aware once things are settled, of where each dog is, and what they’re doing. 4. Avoid things that you know cause conflict. Jackyl loves to wait until I’m distracted, and then tries to steal toys from the other dogs. Depending on who’s toy he takes, the occasional fight breaks out. Usually with his brothers, Chewy and Woobie. The dogs that he spends nearly every minute of his time with. It all comes down to each dog’s individual personality type. (Learn more about the 6 Main Personality Types of Dogs.) Most of our foster dogs are Independent, Adaptable, or Outgoing personality types making them more easy going than our Confident Big Boys. By making sure that none of the toys, bones or other triggers is in the area in which we are going to be when I’m distracted works well for us. Even if it means gating the dogs from my area while I’m busy. 5. Crate training. Utilizing separate spaces. The dogs sometimes need a break from each other. 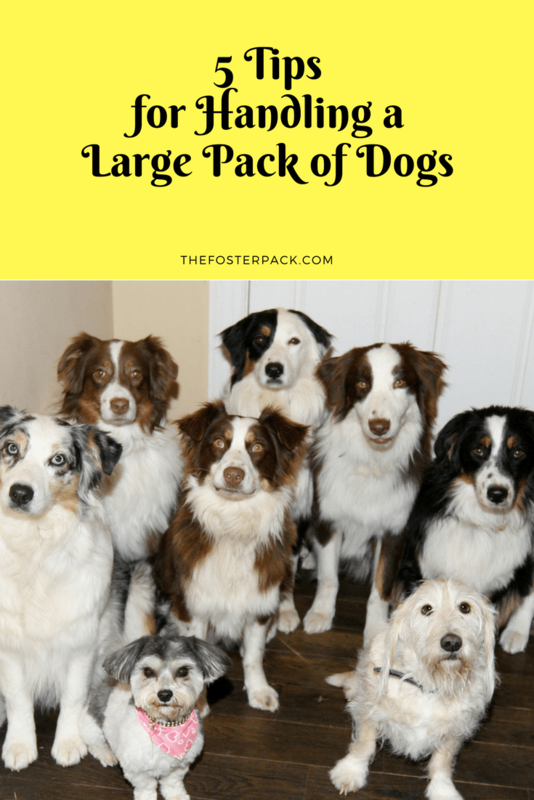 Especially if there are varying ages in the large pack of dogs. Older dogs can only be expected to tolerate puppy behavior for so long. Having social time for a while, then separating them for a while gives the dogs a break from each other. And a chance to calm down. Crates are a great way to separate the dogs, not only at night or when you’re gone, but also when they just need a break from each other. Most of our dogs spend time in their crates during the day, by choice. It’s their “safe” space, even with the doors open. The other dogs are not allowed to bother them when they are chilling in their crates. Dog or baby gates are great for maintaining separate spaces too, if you choose not to crate train. Or if you don’t like to feed the dogs in their crate, they can be gated into separate rooms. Do you have any tips or trick you use to handle a large pack of dogs?